Part of Southbury Collection. Crafted from wire brushed oak veneers. Fossil and parchment finish with a glaze over antiqued chipped paint. Create old world look and feel. Picture frame moldings. Subtle shapes and tapered legs. Beautiful drop-ring hardware. Soft close drawer guides. 4 wood framed glass doors. 3 drawers. 3 adjustable wood shelves. Adjustable levelers. Center support foot. Brown silverware insert in top right drawer. With a tradition dating back over 300 years, the Cherry Grove features a classically elegant style. Features such venerated details as molded aprons and edges to make you and your guests feel like landed aristocracy (even if you already are). 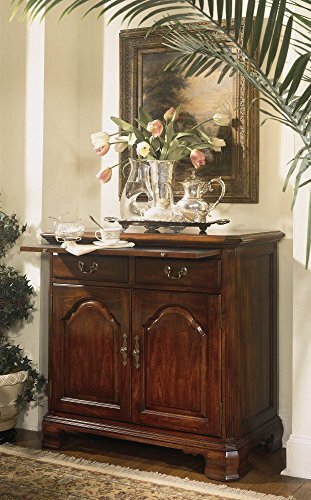 This piece is completed by cathedral cherry veneers over sturdy alder and other hardwoods, with a deep classic antique cherry finish. Features: 2 drawers 2 doors 1 adjustable shelf 1 pull-out shelf 2 silver trays . Features: Side Board Crafted of Maple and Burl Ash Veneers and Solids and wood products Amber Color Finish Aged Brass Color Hardware Includes two small storage drawers on top Silver tray in top left drawer One large storage drawer on bottom One door with one adjustable half shelf behind door Wine glass storage on sides . Specifications: Overall Dimensions: 40" H x 41.25" W x 18.25" D Weight: 165 lbs Manufacturer 1-year warranty . Recommended Care: Dust with a soft clean cloth slightly moistened with water; always rub in the direction of the wood grain Avoid hot dishes, moisture and harsh solvents Do not place beverages and pliable materials on wood surfaces Furniture should not be placed near heat source or in direct sunlight . 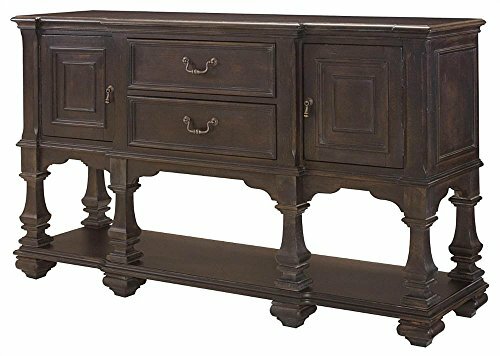 Designed for an urban chic setting, classic antique or rustic vacation home, the Camden Collection by American Drew offers class and casual sophistication in every piece of furniture. 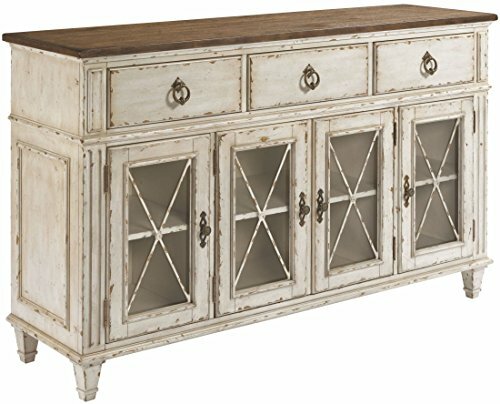 This collection has a distressed antique buttermilk finish that accentuates the wood grain and brushed nickel finish hardware for added elegance. Simple yet practical, the American Drew Camden Collection will add warmth and comfort to your home. 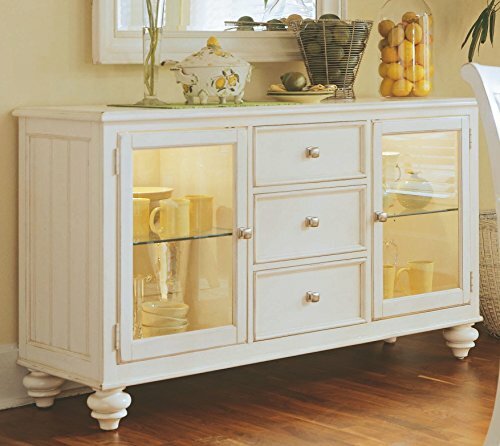 Features: 2 Glass Doors with 1 Adjustable Glass Shelf in Each 3 Drawers Silver Tray 2 Can Lights Finished in Distressed Buttermilk Touch Lighting. Specifications: Overall Product Dimensions: 34" H x 60" W x 19" D .
Two doors. Doors with adjustable shelf each. Silver tray top drawer. Bottom shelf. Levellers. Shelf: 16.63 in. W x 15 in. D. Area behind doors: 16.88 in. W x 15.38 in. D x 17.5 in. H. Overall: 68 in. W x 19 in. D x 40 in. H (227 lbs.). Tribecca mixes it up with modern; Art Deco; and Asian influences; lighter scaled; with classic clean lines and pared down forms; Tribecca's inviting textures; rich wood tones and nickel finish hardware could be just the fresh look you've been trying to imagine for the new retirement condo on the shore or a trendy city loft. 912-040/850 Features: -Two glass shelves.-Two drawers.-Silver tray.-Mirror can be mounted vertically or horizontally. Includes: -Mirror supports included. Options: -Available in a root beer finish. 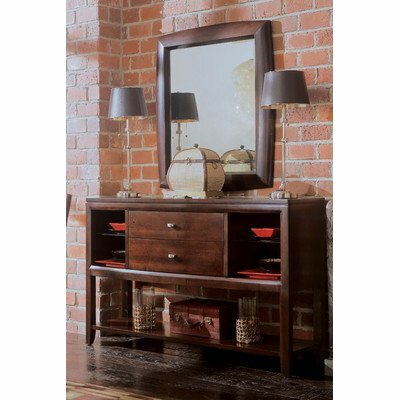 Dimensions: -Mirror dimensions: 37'' H x 42'' W x 3'' D.-Credenza dimensions: 38'' H x 60'' W x 18'' D.
68 in. W x 21 in. D x 38 in. H (245 lbs.). 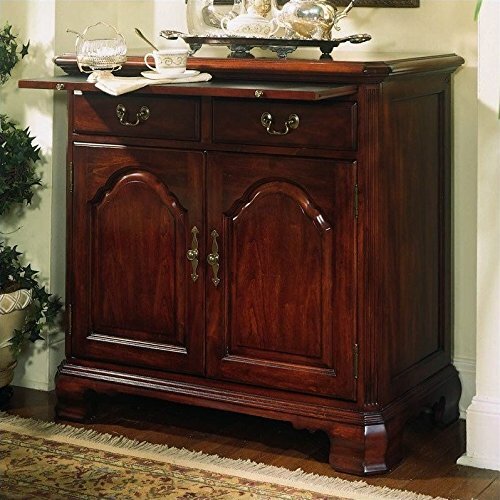 Looking for more American Drew Sideboard similar ideas? Try to explore these searches: Times Square Scene Setter, Laminated Top Pub Table, and F-Series Accent Accent Series. 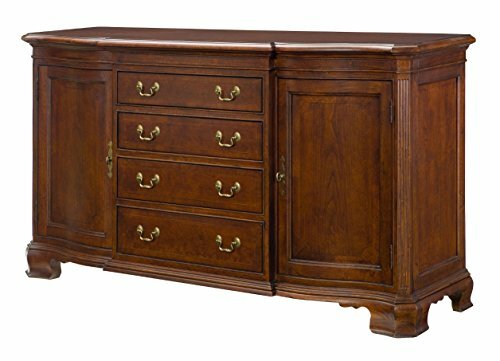 Look at latest related video about American Drew Sideboard. Shopwizion.com is the smartest way for online shopping: compare prices of leading online shops for best deals around the web. 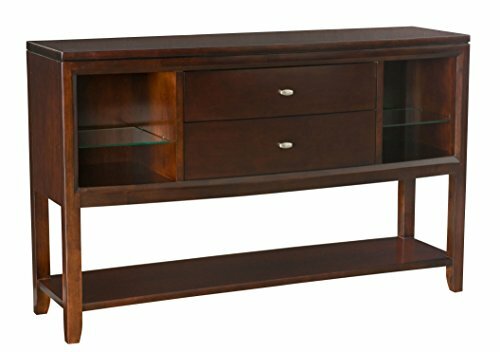 Don't miss TOP American Drew Sideboard deals, updated daily.